and the challenge at ScrapTiffany is to scrap baby pictures. I didnt have any of my baby pictures around (hey Mom, can I get a few baby pics to make copies of?) so I took one of each of my littles, converted them to B&W and used them together on one layout. I love how much alike they looked just minutes after being born. I guess all babies look pretty similar moments after being born LOL! 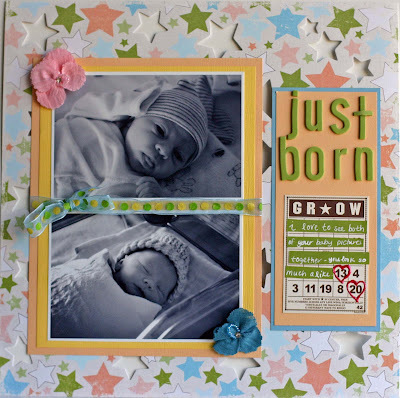 Head on over to ScrapTiffany to see the other adorable baby pic layouts and if you take the challenge, email it to Tiffany by Friday. The title of our kit this month has significant meaning to us. We have loved so much of our “little adventure” we embarked on almost two years ago. Color Me Daisy has been a labor of love, but it has also taken us away from some of the most important parts of our life. We knew this would take our time, but as our sons get older we realize that we are missing more of their lives than we are willing to miss. - We plan to release a limited quantity of kits up to 6 times each year with a single purchase option, as a result we will no longer offer monthly subscriptions. - Kits prices are estimated to range from $30-$40, plus shipping. - Our kits will still feature the latest and greatest from the hottest manufacturers with a mix of papers, embellishments, and extras to keep your creativity blooming. - To be notified first of our kit offerings please go to our home page and subscribe to our newsletter. We will continue to advertise when we release kits, but newsletter subscribers will be the first to hear of our kit offerings. Subscriptions will be cancelled after the February kits have been shipped. Prepaid subscribers will be contacted to make arrangements for refund options. If you have any questions that we have not addressed here, please contact us at info@colormedaisy.com. We thank all of our wonderful customers for your patronage, and hope you will continue to choose Color Me Daisy when we launch our new kit format in April. 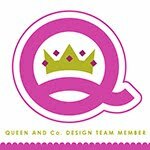 I am glad I had the opportunity to work with Michelle and the amazing kits she creates and the other talented design team members. I love the layout of your babies! I like how you used that GROW bingo card, too. I really have enjoyed working with you at CMD and Posh. I hope to keep in touch in the future!! Love your baby picture layout! They do look alike....I thought it was the same baby! Great job.